Dog owners can use the Fujitsu Wandant NFC-enabled pedometer, an Android NFC phone and a cloud-based analysis service to collect and track detailed information about their pet’s health and fitness. Dog owners in Japan can now equip their pets with an NFC-enabled pedometer which automatically records how far the animal has walked, along with a range of other health metrics. The Fujitsu Wandant incorporates sensing technologies more often found in mobile phones into a tag worn on the dog’s collar. The device automatically measures and records the number of steps taken by the pet, as well as shivering motions and temperature changes. The pet owner then reads data from the Wandant pedometer with an Android NFC phone, which sends it to a web-based analysis service that uses charts to make trends in the dog’s activities easy to understand at a glance. The device can also be interrogated with an NFC reader attached to a PC. 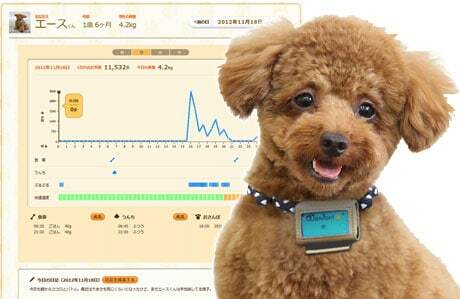 The Wandant and its associated web service are designed to allow the user to continuously monitor and manage the dog’s health and prevent obesity, which Fujitsu says is a growing problem in Japan. Pet owners can add additional information at the website, including food volume, stool conditions and current weight. The device uses a three-axis accelerometer and automated inference technology to count the animal’s steps based on detected foreleg movements, the speed of foreleg movements, and leg length, says the company. The 16-gram device communicates via NFC-F (Felica), offers four months of battery life and will retain logged data for up to 14 days. The Wandant is available in Japan now at around 9,800 yen (US$120). One year of web service is included, with subsequent use costing 420 yen ($5.10) per month. Fujitsu expects the service to have 400,000 accounts active by 2015.